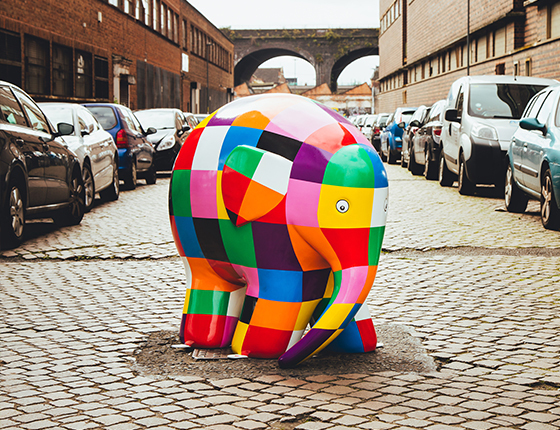 For 10 weeks in the summer of 2019 a parade of 40 fabulously colourful and unique elephants shall be taking you on a trail around the beautiful city of Plymouth and surrounding areas. From the hustle and bustle of the city streets to the peace and grandeur of the Hoe, and from the green spaces of Plymouth to the spectacular coastline; Elmer’s Big Parade will navigate you around Britain’s Ocean City. St Luke’s Hospice Plymouth is working in partnership with Wild in Art and Andersen Press to bring this mass participation, family friendly, art trail to life; featuring the much beloved children’s character of Elmer, by Devon born artist and author David McKee. Alongside Elmer there will be 40 further sculptures on parade; each featuring a unique design created by some of our amazing local artists, both well-known and emerging. This is a fantastic opportunity to explore all the city has to offer whilst being enchanted, inspired and amazed by the sculptures themselves. At the end of the summer each of the beautifully designed Elmers will be auctioned to raise funds for St Luke’s Hospice Plymouth, to enable us to continue to provide our outstanding compassionate care. …and nor do we. Not only will Elmer’s Big Parade bring businesses, artists and the community together but it also offers the opportunity to create those lasting memories and make a real difference to the patients and families of St Luke’s Hospice Plymouth. Last year our nurses were able to care for more than 3,480 patients living with life-limiting illness at home, in hospital or at the hospice. However, we know that there are many more who need our help. The money raised through this event and other community events will help the charity to continue to provide the care and support to patients and their families throughout Plymouth and the surrounding area. We are seeking sponsors to join us on parade. Get your business messages ‘herd’, drive customers to your door, create partnerships across the city and be part of this exceptional event. Download our sponsorship pack to find out how you can be part of Elmer’s Big Parade Plymouth. Our team would be delighted to meet with you to discuss this opportunity to align your business with one of Plymouth’s best loved charities and help make a difference in our community for years to come. Our call to artists for Elmer designs has now closed. Thank you so much to everyone who took the time to submit their design; we have received an amazing array of creations and the selection process is going to be very hard! Watch this space for an announcement of which artists are going to be painting our beautiful sculptures. Would you like to know more about Elmer’s Big Parade Plymouth, or get involved in this event? We would love to hear from you. Please fill out the form opposite to get in touch.